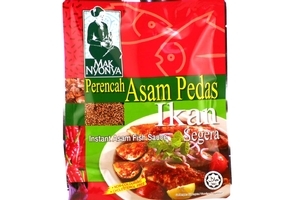 Mak Nyonya Instant Asam Fish Sauce Mix (Perencah Asam Pedas Ikan Segera) in 7oz (200g) sachet. Maknyonya is proud to present, a simplicity in cooking, an easy to present, convenient, tasty as well as delicious in collections of Nyonya sauces. It is the most relaxing way to preparing an easy-to-cook Nyonya delicacy to fill up your family members under the warm environment to enjoy a flavored unique Nyonya food. Product of Malaysia. Nyonya food is also native to Penang and Singapore. However, over the years, distinct differences have evolved in nyonya cooking found in Penang and Singapore than the one in Malacca. Asam, onion, lemongrass, chilli, salt, spices, and edible oil (palm oil).